How do you join the Property Owners Association? Is it legal for an neighborhood to create a private beach on public property in NYC? 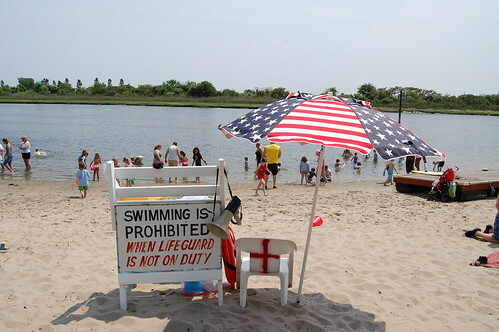 Aren't NYC beaches open to the public and regulated by the parks department? You sir are a Douchebag. Yes it is legal. The NYC parks department runs and operates all PUBLIC beaches; not private. This is consider a private beach along with Breezy Point and Sea Gate amongst many other beaches in NYC. If there is anyone to appeal this in court to claim it should not be, Kiddie Beach would fall under a Grandfather Clause stating that the Property Owners Association created this beach club before there were any laws stating otherwise. They maintain the property and the cost of membership pays for the maintenance; in the membership agreement you must be a member of the POA and a resident of GB. Don't try to ruin something good in our community with your nonsense. Breezy Point and Sea Gate beach clubs are not just for Resident of those neighborhoods. it for anyone who pays can be a memeber. 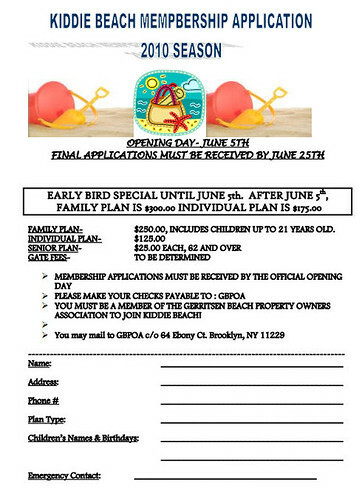 why do have to live in gerristen in order to be a member of the beach club? They are still considered private beach clubs because you have to pay a membership and only members are allowed on the beach premises. The POA whom operates KB has the right to state the rules for the beach club, one of their guidelines is to be a Property Owner living in GB. Although this is just my opinion, KB isn't a very large beach; it does have an occupancy limit and would be too crowded if you were to open it up to all of Brooklyn. I'll be looking for those occupancy limit signs. Who's kidding who, there are only rules and limits when they are needed to be applied. You catch more flies with honey. Next time, don't use vinegar. Inquiring minds need to know, thats all, take a chill pill lady. Inquiring minds needed to know and she told you! Just a suggestion…. Why not get the community and the businesses to put in a Pool? I'm sure everyone would put money for it. That way the children can swim in clean water. insurance costs has been the reason there is no pool. Go to BPSC or Silver Gull, or wherever. The water in the creek is cleaner than it was 40, 30, 20 years ago. But if you don't like it, don't try and change everyone elses life, go where you want. The idea behind Kiddy Beach was and is accessability for all residents. The exclusivity that would naturally happen if it cost thousands a year to belong would defeat it's purpose, which is to provide a great, safe day at the beach for kids and their families at a reasonable, affordable price. Some anon made a comment above about the seniors getting an 80% discount, that's because it has always, since it's inception been a great place for our seniors to meet and hang out after the long winters. We have always loved and respected our seniors, lol, if not always as individuals, as a group, and it has been kept completely affordable for all. May it always be so. And there is no love for the children of GB. I mean you make it clear you bend over backwards for the seniors as group so they can gather there, now who would be more likely to enjoy a beach or picnic area in the summer heat, my guess is kids and the mother who needs some relief for her little ones. But what are you talking about? 250.00 for the summer is very cheap for a family to be able to enjoy the beach. There ARE expenses, maintainence, taxes, insurance. Why does it bother you that seniors are given a break? Stay in your boat. What if you rent in GB, and don't own? Can you still join KB?